Eurocom Corporation (www.eurocom.com), is now launching the EUROCOM Scorpius Ultra High Performance Notebook with support for dual graphics technology from NVIDIA GeForce, Quadro and AMD Radeon, powerful Intel Core i7-3920XM Processor Extreme Edition, up to 32 GB of DDR3 1600 memory and three storage drives plus one mSATA drive. Featuring dual graphics technology including dual NVIDIA GeForce GTX 680M GPUs featuring 1688 CUDA cores, 8 GB of DDR5 video memory, with the graphics clock running at 720MHz, as well as dual AMD Radeon HD 7970M featuring 1560 Stream Processors, 4GB GDDR5 video memory, with an 850 MHz engine clock allowing gamers to play the most demanding games on maximum settings. On the professional graphics front, the EUROCOM Scorpius supports the newest NVIDIA Quadro K5000M, K4000M and K3000M graphics for the ultimate in portable power, based on the 28nm Kepler architecture, the Quadro K5000M GPU packs 1344 CUDA cores and 4GB GDDR5 graphics memory. With no Optimus support the EUROCOM Scorpius is all about extreme graphics performance with no compromise! Driving the system is an optional Intel Core i7-3920XM Processor Extreme Edition running at up to 3.8 GHz with 8MB of L3 cache, which delivers exceptional high-definition multimedia, multi-tasking and multi-threaded performance. These high-performance 3rd Generation Intel Core i7 Processors allow users to simultaneously run multiple applications at the same time -- all with increased performance. The EUROCOM Scorpius supports Intel’s Extreme tuning Utility to allow users to tweak the performance of their system to whatever they choose. Up to 32GB of superfast DDR3 1600 SODIMM memory is also supported via four sockets. With such massive amounts of RAM available, the Scorpius becomes a great tool for virtualization and high performance computing. In the EUROCOM Scorpius, up to 3 storage drives (SSD, HDD, Hybrid HDD) are offered plus an mSATA drive. With these storage configurations, Intel Smart Response Technology is supported, it is designed to give users enhanced system performance and responsiveness. Smart Response Technology is an intelligent caching setup that monitors data reads and writes to your storage drive and caches the most used or frequently accessed data. The Scorpius supports RAID 0/1/5/10 for increased storage performance or redundancy. The EUROCOM Scorpius is the ultimate in Multimedia Entertainment system with support for Sound Blaster® X-Fi™ MB2, subwoofer, 2 watt speakers and external 7.1CH audio output support. Sound Blaster® X-Fi™ MB2 software suite is a powerful audio platform equipped with state of the art audio technology and THX TruStudio Pro along with a host of other software to enhance the audio of games, movies and music. The Scorpius has many connectivity options to allow users to connect the system to external displays for gaming for video streaming including: HDMI 1.4a, S/PDIF, Display Port 1.2. The EUROCOM Scorpius is built with an ultra heavy duty design for unintentional abuse while on the go. It is a fully upgradeable system with support for the best in mobile technology. 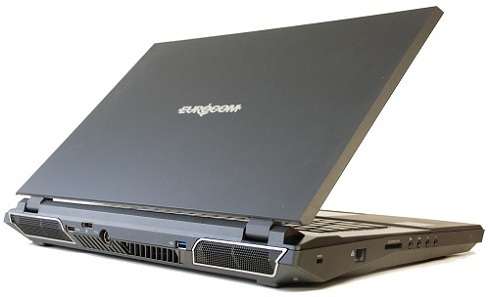 The EUROCOM Scorpius can be customized based on graphics, processor, memory, storage, display and wireless technology. The EUROCOM Scorpius comes with an illuminate backlit full size keyboard with numeric keypad. The backlit keyboard helps to increase usability in dim lighting conditions, to ensure operators can see the keyboard in nearly any environment.